The best way to predict the future is to study past behavior. This is the underlying idea behind Big Data Analytics. The 2008 Obama election campaign was one of the first to take advantage of data-driven methods in the race to an elected office. The Obama campaign had a data analytics team of 100 people. This shows how deeply data analytics impacts the world. From recommending products to customers on e-commerce websites (i.e. using predictive analytics) to electing the most powerful official of the free world. Big Data Analytics is indeed everywhere. Data analytics has evolved itself to become the brain of every election campaign since the Obama campaign. Data analytics helps the election campaign to understand the voters better and hence adapt to their sentiments. Now let‘s find out how data analytics affects the elections and how election campaigns use it . 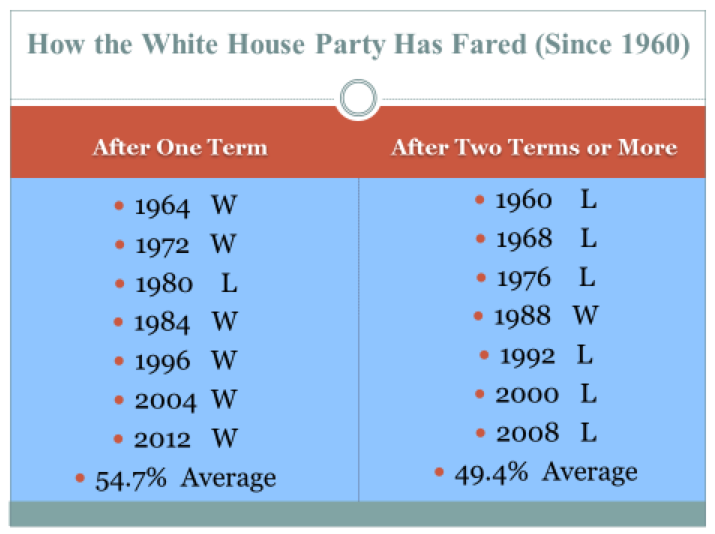 The 2016 race to the White House had data at its center and made itself an unstoppable force. The question here is how it affects the outcome of the election? Positively or Negatively? In other words, does data analytics have the ability to turn election results? Social and polling data can affect the voters. Social websites such as Facebook and Twitter optimize their feeds to the target audience to promote voting. 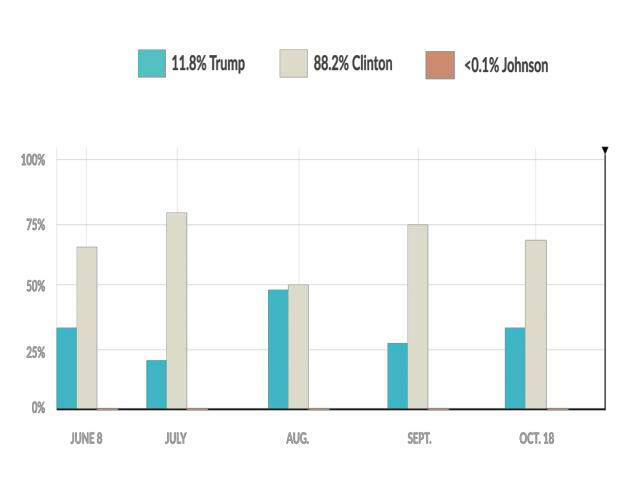 Conversely, you see Hillary Clinton leading by 73% chance to take over the White House in the polls (released by some analytics firm) to Trump. In reality, would you agree that a good number of people would feel that the election result is obvious now? As a result, I feel that there will be a negative impact on the voter turnout in such situations. Websites like Five Thirty Eight, primarmodel and Real Clear Politics use social, polling data to predict the election results. To emphasize, if they tweak those results for a single candidate, then it can give an altogether different perspective to their millions of followers, who now after knowing the probable outcome may not turn out at the booths to support their candidate. Hence, it is crucial to realize the downside as well. There are two subdivisions of extracting data for an election campaign. Firstly, social data and polling data and secondly public data which becomes a part of Big Data. It helps the candidate to understand the voters better and design the campaign accordingly. Moreover, this brings more clarity to the election campaign. Both Clinton‘s and Trump‘s campaigns are relying on technology for reaching out to the voters in the 2016 race for The White House. 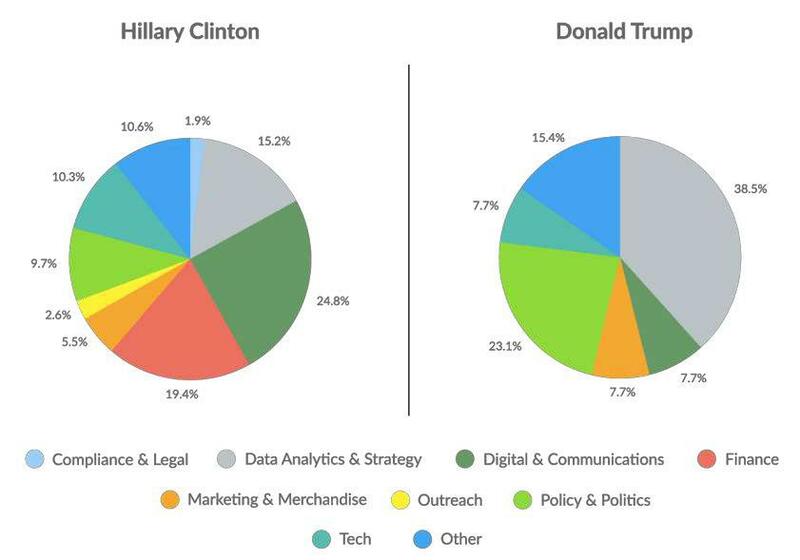 The Campaign job distribution for both Hillary and Trump Campaign obtained from ValuePengiun is shown below. We can observe from the graph that Data Analytics and the resulting Strategic Operations takes up a huge chunk of the workforce of both the presidential campaigns. A swing state is a state where the two major political parties have similar levels of support among voters, viewed as important in determining the overall result of a presidential election. Swing states are one of the most important factors in the US elections. Red states are ones that are dominated by the Republicans (i.e. Trump‘s party) whereas the blue ones signify the dominance of the Democrats (i.e. Clinton‘s party). Hence, swing states are also known as purple states as both parties have similar electoral support in these areas. Large amounts of public data, polling data, sentimental analysis of Twitter and Facebook feeds are used to determine the swing states. In particular, winning the swing states can make a big difference in the electoral votes. These are the best opportunity for a party to gain electoral votes. So, political parties majorly focus on these states while strategizing their election campaign. North Carolina. ―Tipping-point chance‖ as described by FiveThirtyEight is the probability that a state will provide the decisive vote in the Electoral College. This is a good indicator of the Swing states. Using big data analytics, the election campaign analyzes the demographics of the states where they fall behind their opposition. Offline marketing like billboards and television ads is deployed strategically to target the audience using data analytics. It helps them to understand the states where the campaign needs to improve on the marketing and hence turn the voter sentiments around. 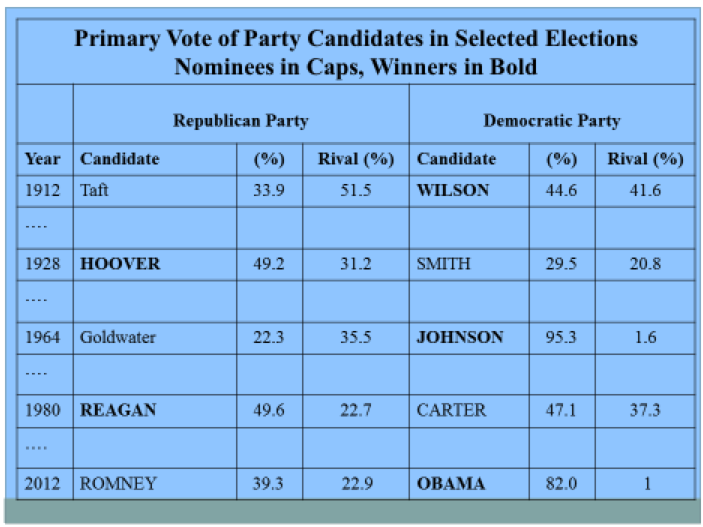 These predictions come from primarymodel.com based on a statistical model that relies on presidential primaries and an election cycle as predictors of the vote in the general election. In a maìtch-up between the Republican primary winner and each of the Democratic contenders, Donald Trump is predicted to defeat Hillary Clinton by 52.5% to 47.5% of the two-party vote. He would defeat Bernie Sanders by 57.7% to 42.3%. Now, let‘s look at some of the notable players who use Data analytics on polling, social and big data for the forecast. In 2007, Nate Silver launched Five Thirty Eight. Silver made data analytics super cool with his famous 2008 US Presidential election predictions. Five Thirty Eight‘s 2008 presidential election forecast had 98.08% accuracy in predicting the winners in each of the states. Notably, they correctly predicted the winner of 49 of the 50 states including the District of Columbia. Overall, Indiana is the only state in which they missed out. Five Thirty Eight‘s prediction on ―chance of winning‖ for the 2016 election cycle is shown below.Before the advent of model-mania, a common way to think about polling was that if the polls are close, the race is a “toss-up,” and it could go either way. RealClearPolitics, for instance, continues to classify any race where the polls average out to a 5-point lead or less for one candidate as a toss-up, instead of making more specific forecasts of some kind. Though based on most of the same underlying polls, FiveThirtyEight and its kin try to come up with a numerical percentage of how likely each candidate is to win, with the help of historical data and mathematical modeling. Out of all that, FiveThirtyEight calculates a candidate’s expected vote share. This looks pretty similar to a polling average — for instance, in the Florida Senate race, they show Democratic Sen. Bill Nelson leading his Republican opponent Rick Scott by 3 percentage points (as of Tuesday afternoon). Then, though, comes the big leap. Working off that expected vote share, they simulate the election thousands of times — comparing to a wealth of historical data on how past elections turned out, and trying to incorporate uncertainty. What comes out at the other end is the candidate’s projected chance of victory. For Bill Nelson, that’s 69 percent. Once they do that for every House and Senate race up this year, they come up with an overall estimate of the chance each party will win control of each chamber. Something like an 81.3 percent chance Republicans will keep the Senate, and an 85.6 percent chance Democrats will take the House. An 80 percent chance of winning compared to a 20 percent chance seems like a huge advantage. Yet in commentary about their models, Silver and the rest of the FiveThirtyEight team (I recommend their podcast) repeatedly stress that an 80 percent chance of victory is not a done deal — not even close. Their argument is that an outcome that’s 20 percent likely will happen 20 percent of the time. The most infamous example of something like this was, of course, the 2016 election. FiveThirtyEight’s model gave Hillary Clinton a 71.4 percent chance of winning, and she, er, didn’t win. But though this put an end to the legend of Silver as the forecaster who “called” all 50 states “correctly” in 2012, he ended up something of a winner anyway. In the days before the election, even though his model showed Trump as the underdog, it gave Trump a substantially higher chance of winning than any other mainstream model out there. For that, some accused him of “panicking the world” and “putting his thumb on the scales,” and others opined he was “cautiously” trying to ensure his forecast looked right whatever happened. In the days before the election, I dug into FiveThirtyEight’s modeling choices and concluded they made “a whole lot of sense.” Most broadly, I wrote, this was because “Silver’s forecast is just more uncertain that the result will match what the current polling data shows.” He understood quite well that there could be a polling error, a last-minute swing, or both. In the end, the worst error made by other 2016 forecasters was that they drew far-too-confident conclusions from Clinton’s relatively narrow, single-digit poll leads nationally and in key swing states.